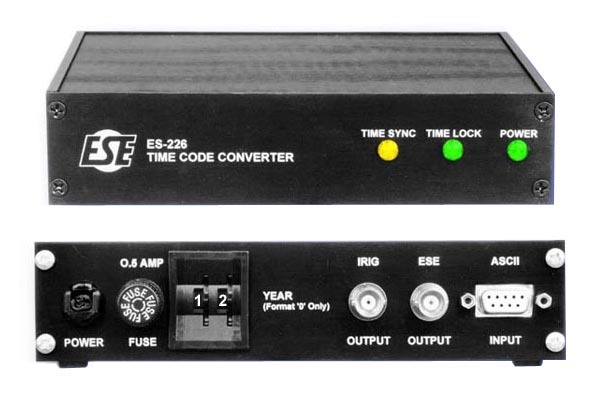 The purpose of the ES-226 is to provide a Master Clock or a computer's clock (or any other source of ASCII, format "O", "1", "8" or NMEA-0183 GPRMC/GPZDA) the ability to supply time information to other pieces of equipment. The IRIG-B or IRIG-E time code output can interface with most Voice Recorders used by a 9-1-1 PSAP (Public Safety Answering Point). The ESE Time Code output is capable of driving up to 100 Slave Clocks (analog or digital), Video Inserters or Time Code Comparators at a distance of up to 4000 feet.